It is therefore understandable that whenever people advocate that recruiters take a very candidate/career-centered approach to recruiting, you generally hear a collective “yeah, right” groan from recruiters. When it comes down to it, third party recruiters work for their clients, corporate recruiters work for their companies – end of story. If you care too much about the candidate’s career, you run the risk of working for the wrong party. It is in a recruiter’s best interest to be a great advocate and friend to their candidates, and provide excellent “customer” service. A recruiter often finds themselves playing a small part of career coach – giving interview tips, career management advice, and even helping to mediate disputes between managers and new hires. This aspect of a recruiting career is often overlooked – providing the “grease” for the wheels of hiring means a lot more than finding a resume on the Internet and handing it to a hiring manager. Recruitment and hiring is a long process and relationship which does not even end with the candidate’s first day of work. However, because recruiters often play part the part of candidate-centered roles, it can get confusing. Some recruiters forget their core task – identifying and placing talent – and start believing that their primary goal is to help candidates. We all know this generally leads to things like three hour qualifying interviews, tons of time spent redoing candidate resumes, and long after-hour calls about the candidate’s recent divorce… It’s a good thing to develop a real relationship with candidates, but experienced recruiters generally know how to keep focused on their core business of working for their company or client. An experienced recruiter learns to quickly move on to the next candidate if they aren’t an immediate match for a particular position. Recruiters learn to accomplish their placements now while building solid candidate relationships for the future. The trick is to develop broad candidate pipelines and relationships for the future while maintaining a sense of urgency on immediate requirements. There is no other way to say it – recruiters need to keep their eye on the ball. If recruiters have to be careful not to work for candidates instead of clients, you might think that recruiters should forgo broad talks with candidates about their careers. If a recruiter’s goal is to make placements and quickly move on to the next qualified candidate, it would seem that having a conversation about career goals and aspirations would be a big waste of time. Qualify them in or out and then move on… right? Recruiters typically err on either side of the equation – spending too much time with candidates as career counselors or “slamming” resumes based on core requirements only. If you’ve been in recruiting for a long time, you have probably seen entirely job-description-based recruiting work to some degree. Some recruiters operate much like Google – they see a keyword and a light-bulb goes off. For certain skill-based recruitment like software or accounting, a recruiter can experience success through this very rote style of keyword based recruiting. The best recruiters, however, seem to have one thing in common – they balance client and candidate needs. They work their current requirements hard and make placements for their hiring managers, while not alienating candidates that are not a good fit. Great recruiters know who their clients are (external companies and internal hiring managers) but still provide personal, relationship-oriented service to their candidates. Recruiters who recruit solely on skills and keywords of course can’t be at the top of their game. In order to be most successful, recruiters have to “get deep” with candidates and understand their broad career goals and job preferences. But how do you “go deep” and maintain a high volume of candidates? How is a recruiter supposed to focus both on recruiting to the client’s job and recruiting to the candidate’s career? Job and skill-based recruiting is a fairly quick process – you can scan resumes, use keyword match tools, and have quick candidate conversations for qualification. When we think of “career” recruiting, we automatically assume a much longer process. Recruiters who recruit to the candidate’s career tend to flesh out every detail of the candidate’s experience, job preferences, and career goals. Career based recruiting can be a very long process – time that most recruiters simply cannot afford to give. Perhaps the issue is the false assumption that candidate and career based recruiting is of an order of magnitude longer and more difficult than job and client-centric recruiting. Great recruiters consider the totality of a candidate’s preferences and background. They can make better, faster placements because they can quickly access and discern nuances of preference from both client and candidate. However, they can do this not because they spend a year developing an intimate understanding of a candidate’s career and not because their interests are completely aligned with their candidates. Experienced recruiters should understand that candidate careers, aspirations, and preferences should be quantified in much the same way as job skills or years of experience in a particular industry. The secret to high-volume, relationship-based (career) recruiting is to obtain candidate preferences and career concerns in as routine a manner as you do for core job skills. It may sound harsh, but “Dream Job:” should be an entry field in your applicant tracking system. “Industry Preference” and “Company size preference” and a host of other candidate career preferences should be tracked and considered for each new job. The most successful recruiters discover that all the rich details about a candidate’s life and career can and should be discussed, considered, and tracked – but that process should not require a different process than your regular skill-based recruiting. The best recruiters match candidates with jobs efficiently- however, the match is based on the candidate’s career, not just their resume. 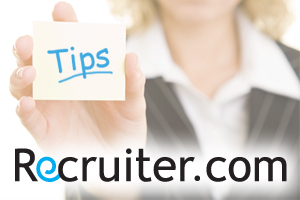 Career recruiting doesn’t have to weigh down the efficiency and speed of your recruiting. In short, make sure that you assess and track deep and constructive information about your candidates, but that you do so with efficiency in mind.